C3 Vettes are typically more cruiser than bruiser, but today's Nice Price or Crack Pipe '75 is painted a metallic shade of bruise, and you might find its price makes it a plum deal. The horror over Porsche's introduction of a tarted up Tourag has not abated, as evidenced in the vitriolic responses to yesterday's 2004 Cayenne. Despite all the haterade quaffed in its name, its seemingly low, low price equated to a pretty decisive 69% Nice Price win. Mmm, spicy. What's your favorite color for a car? I know, some cars look better in certain colors than do others, but typically most people are going to say something like black, silver or red really make their boat float. 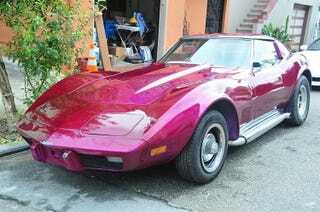 However, if you happened to say purple, have I got the 1975 Corvette coupe for you. This San Francisco-residing ‘Vette comes from the era that was the nadir of the Chevy sports car's performance, but time wounds all heels, and this ‘Vette is now old enough to have limbo'd under the bar of interest by either the DOT or California's pollutant-police, the CARB. Like your 21st birthday, that means this Corvette is free to imbibe without inhibition, or such mandated fun deflators as catalytic converters, air pumps and non-adjustable carbs. In their place, this plum-colored peach sports what's claimed to be a built SBC that's had its heads ported, and which is topped with a 750 cfm 4bbl. Headers take the engine's flatus to external side pipes which give the car a look that fairly demands that anyone within twenty feet of it wear aviators and a pornstache. Inside, there's a claimed all-new leather interior, and between the flat as Nebraska seats you'll note a rare site in Bicentennially adjacent year ‘Vettes - a row-yer-own stick. The car also apparently comes with your choice of tiller, including one that looks like it has abrasions that are about to scab-over. I'd go for the loose one in the seat. It looks like there's also some aftermarket wood trim in there, if that kind of thing gives you wood. Other new parts included are a later-style rear end-cap, an aluminum radiator, and transverse leaf for the IRS. On the downside, the seller says that the car's not a good night driver as the headlights don't seem to be functioning, and there's a bunch of wiring for the stereo he's only half-assed installed. Oh yeah, and it's purple. The paint isn't bad, although typically ‘70s, the nose is eff'd up like it had done too much coke. The wheels also may be an issue as, while they match left to right, they don't front to back, and the rears seem to be of a size that may require a mullet to fully appreciate. Thankfully, that's a problem that can be easily rectified with a lug wrench. The C3 ‘Vette, even in plastic bumper mode style represents about the most audacious of the Corvette bodystyles, what with its extreme coke bottle shape and flying buttressed T-top roof. These days they do somewhat suffer from the stereotype of being STD enablers, but if you're willing to overlook that, they can be pretty entertaining to drive themselves. This one will require either a trade of cash, and in the case of the trade, the seller is pretty much open to any car or bike other than this ‘Vette. As far as cash goes, he's looking to get $8,000 for Barney, and it's up to you to determine if that price makes it super-dee-duper, or just a big dumb purple dinosaur.